Here I attempted to do a no line coloring on the tree with Copic Markers with the new "A Beary Christmas" stamp set. (9/15 Release) I really struggled but I'm glad I tried! This is what makes this challenge so great! Feel free to go out of your comfort zone and just practice! You may end up loving the end result while gaining some experience! The premise of “The Daily Marker 30 Day Coloring Challenge” is to color something everyday even if it’s for five minutes. (However feel free to jump in or out as time permits). Any coloring medium is welcomed. Click here for DAY 1. TO UPLOAD YOUR COLORING or here on Instagram or here on Facebook (FB is a closed group). Please remember to use the hashtag #thedailymarker30day. For kids & young adults, use #thedailymarker30daykids. If you have any questions about “The Daily Marker 30 Day Coloring Challenge” you can refer to Kathy's post. Your next stop is Stamping Bella! If you encounter a broken link please refer to the the full hop list to get you to the next blog. We would also like to take a moment to mention that we are having a fundraiser on our website. Such an adorable card! So excited about the coloring challenge! Your coloring is wonderful!!! I need to try no-line coloring. Love this sweet card! I haven't tried the no line coloring yet but this turned out awesome! Such a sweet card. You might have struggled but your card sure turned out really cute! Love your card and the little bear. I love your cute card! Love the sweet little bears! I am a Texan and really appreciate your generosity! I am not personally affected by the storm but know those who are. #texasstrong! 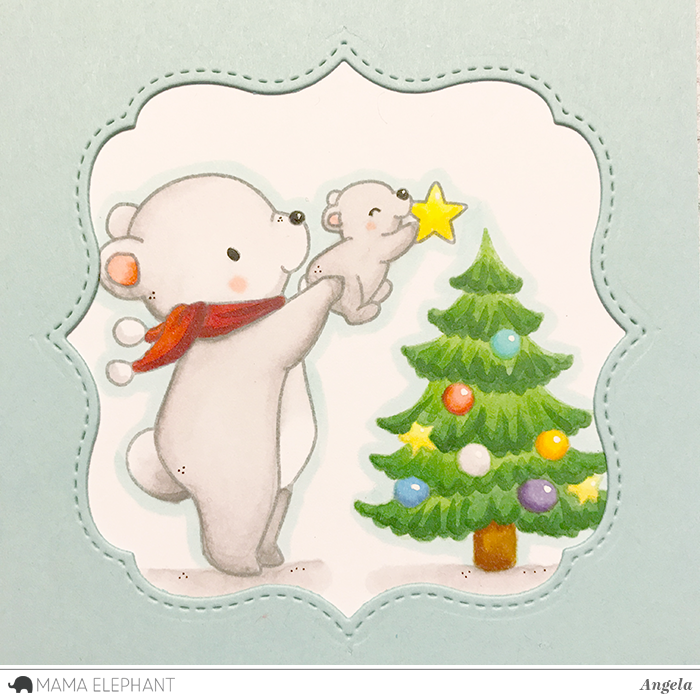 This card is so adorable - sweetest little bears ever! That card is so cute and I loved your no line coloring!!! Great job with the no line water coloring. Love this cute card! Your generosity will be much appreciated by those in need! Such a sweet card. Thanks for the chance to win lol!! Like your card. Looking forward to coloring a bit each day. Yay for the the coloring challenge! That is such a sweet image and the tree is colored beautifully! Cute card. I love how you colored the tree to look like layered branches. Haven't tried no line watercoloring. Yours is gorgeous! such cute little elephants on a happy little card. This card is so sweet! And the little tree looks great! I love the look of no-line coloring and can't wait to try some more this month! Adorable card with lovely coloring ! Super cute card!Thank you for the challenge and the hop! Such a precious little card! Love it! Love Mama Elephant and love that you are donating to help Texas! You rock! Sweet Christmas card. Donation will help. This card is precious and your coloring is amazing! Such a cute card and Xmas tree is so well coloured! Thanks for sharing. I think the results are wonderful. Thanks for sharing. Your no-line colored tree looks great on the adorable Christmas card. Thanks for helping out Texas as well. Very generous and kind of you. What a sweet card, just getting started on my Christmas cards, so this was perfect timing. Love the no line coloring of the tree. love this set, so cute! adorable card! This is so sweet! No line colouring always intimidates me but I have tried it more recently - love your little scene and the tree look looks great! Agree the challenge is a great way to practise these things! Such a cute card and darling bears!! Wow those stamps are adorable!! Perfectly colored! How cute is that image? Makes me smile. I love bears are this image is so adorable! fab card , no line colouring is something I've never been brave enough to try but yours looks great and super cute too, good luck with your fund raising too. So cute. The no line coloring is something I haven't tried yet. This card is precious! Love the little bears! Aww, that is so adorable!! You did an awesome job on the no line coloring on the tree! It totally looks like you just drew it on with the markers. Great job! Your card is precious. I have not tried no line coloring but your result looks very good. Your card is so sweet. Wonderful coloring job. I love the soft look of this card...very beautiful! This card is too precious!!! Very sweet card - thanks for being a sponsor. 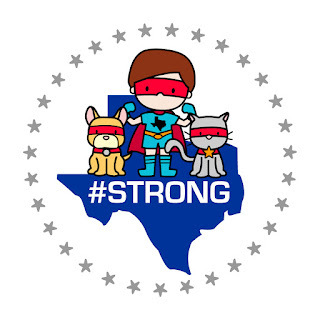 Just the cutest thing and a wonderful idea to help the people of Texas that need it so badly. What a cute card. And thank you for your support of those hurting in Texas. Loving those cute bears. Thanks for the challenge Kathy! Your Christmas tree looks lovely. I think the fact that you can see the various shades of green gives it more character. Well done. What a cute card. You did a great job! What a lovely card and I like the tree, he is beautiful! I love your card and I think your no line coloring is wonderful! TFS! These bears are just the cutest! I hope to try some no line coloring during the challenge, too. Gorgeous card! And another chance to play along! Very cute. Lovely no line coloring. What a cute Image and you did great! I too tried no line water coloring today, using Mama Elephants Botanic Hello. I love how it turned out! You did a good job of the no-line coloring. I still need lots of practice at it. It's so pretty to look at cards that have been colored with this technique. And, if I should win, I would like to donate the product value to your fund raiser as well. Very cute card! Love those bears! Thumbs up for doing something great to help people suffering from hurricane! I love coloring, and trying to to learn more about no line coloring! Thanks for sharing! Love your wonderful card. Beautiful coloring. Beautiful colors...the bears are so sweet! Super sweet card and image. Beautiful no line colouring. Love it. Great start at no-line coloring! Always inspirational! super sweet of you with the donation for the hurricane and this card is just adorable! You did an excellent job!! Such a sweet card!! This card is too cute, my heart will melt ! It's so wonderful to hear you are reaching out to Hurricane Harvey folks! That's amazing! Beautiful designs today too! Such a sweet card! Hoping to have lots of coloured ME stamped images by the end of the month for cards - obsessed! Adorable card! I love the little bears. Thanks for supporting hurricane victims!! What a cute card! I love those little bears! Great card! Have fun when Kathy comes! I REALLY love the design on this card---so precious with the little baby hanging the star!!!!! What set is it from?? Beautiful card - thanks for supporting the hurricane victims! Love ur coloring, pretty card. This card is so sweet! Thanks for the chance to win. I admire your support for the victims of the hurricane in Texas. Oh my cuteness, this stamp set is so very beary sweet. Love it! Those bears are so cute, I love them! What a cute card, I'm new to this card making coloring thing, hopefully I can produce something as cute as this one day soon! Your no-line coloring turned out way better than my first attempt! Thanks for sponsoring this fun hop! Sweet card! Love your little girl and boy stamps- so fun! Thanks for a chance to win!! So cute! It is my goal to learn no line coloring in the near future!! Sweet and precious!! Loved your no line coloring as well! Great image! I love no line coloring! Looks great! I haven't tried no-line coloring yet. Love your card. I haven't tried no line water coloring yet. I think the time has come. I love the halo around your image, it really gives it more depth. I've only tried no line watercoloring once and was happy with my efforts, but maybe it's time to try again. I think your scene is lovely and your watercoloring looks wonderful! You did a great job colouring the tree...sweet image. Your card is adorable and you did a great job on the tree. Such a cute card! Love the adorable bears! Awesome job on the no-line coloring! I love a good challenge!! Awesome job coloring -- such a sweet image! Wow! I'm always envious of those who have mastered :-Pline colouring!! Congrats!!! This is a very sweet stamp! such a cute card and your coloring is great! Absolutely gorgeous! Can't wait for the 10th. Great job on the no-line coloring! It seems like that has a whole different set of go-to rules to make it work. When I tried it, I realized just how much I rely on those black lines! 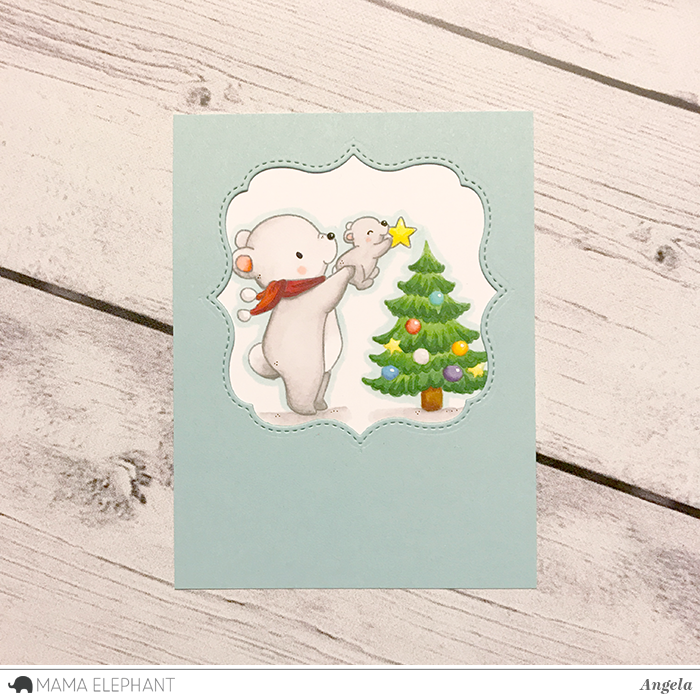 Adorable card and your no line coloring on your tree is great! You are so right about not always staying in our comfort zone and daring to try new techniques! The results can be surprising. Such a cute card...love the bears. Have never been to good at no line coloring, so that's something to work on during this edition of the Coloring Challenge! You're tree looks great! I've been scared to try the no line coloring, as I am not really very artistic, and I think your tree is beautiful. I love the bears decorating your tree. Such beautiful and fun coloring! I'm so in love with this cute bear lifting the baby up to reach the top of the tree! CUTE! I really like your card - the bears are so cute and the tree is beautifully coloured! The no-line tree is so cute. Love the bears. Super adorable card. Great colouring. That is just the sweetest card ever! I can't wait until your new release! I think you did a great job no-line coloring your tree! That's one technique I'm going to make myself try during these 30 days. I've been too chicken to try it so far. I can't wait for this new release, although my wallet is scared...very, very scared!!! Cute card, I love the color combination. Lovely card! Can't wait for the release on the 15th! I'm so in love with this bear and your colouring is perfection. Can't wait to see this set in the New Release!! Such an adorable card! Such awesome colouring! Can't wait to get my hands on some of the new stamps/dies! Angela, your card is just darling and you are right about going outside your comfort zone. I did that yesterday with a project I am colouring and almost gave up but pushed on and was shocked at the finished result. I could not have been happier! Wow, the tree is colored so beautifully. I am hoping I can color each day. I just want to squeeze that baby bear. This image is super cute and so is your card. Thanks for your help with disaster relief for the Harvey victims. Such a gorgeous card. Love the polar bears. And the tree looks great! What a sweet card! Love the little critters and the Christmas theme. Beautiful card - love the no-line technique. It is one I have yet to try so I'm inspired by what you did. Super cute and adorable card!! A+++ on your no-line colouring of the tree; certainly incentive for those of us struggling with this technique to keep on practicing! A most adorable scene! Thank you for the smiles and encouragement! This is absolutely adorable, and fantastic coloring! This is adorable! Is it a new ME stamp coming out then? I love the bears! Such a sweet card!!! this is fantastic coloring! Such an adorable card, real Christmas cutie! Awwww.... so cute! Sweet card. I tried this once, let's just say I need more practice. Love your Adorable card!!! So cute. I love the sweet image. Your card is so adorable, its very tender! What exactly does no line coloring mean? I have heard this a few times. Guess I have some research to do. I love the softness you have created on this card. I love it! Super cute little bear! Thanks for the chance to win. great card, and such an adorable little tree. Such a cute card! I can't wait until 09/15! No coloring is really hard but this came out gorgeous! Absolutely adorable! Love this sweet scene... darling bears! Love the card! This is beautiful! Loving those little bears and the soft coloring! Oh man. That is one technique I just have not gotten the guts to try yet :) Maybe this month!